2016 CIPPE Beijing oil show is around the corner now. It will come within 2 weeks. Are you ready for it? If still not yet get your China visa, it is the high time to apply it now. If you need any support on your visa application, your hotel booking regarding the Beijing CIPPE oil show, please feel free to contact GN Solids Control at sales@gnsolidscontrol.com. GN Solids Control with GN Solids America are ready to offer you 7 × 24 hours professional services. Why 2016 Beijing CIPPE oil show is a good change should not miss? 1) Followed to the largest oil show OTC in Houston, Beijing CIPPE oil show is the second largest oil show in the world. As China leading manufacturers on mud solids control equipment and drilling waste management suppliers, GN Solids Control owns 400 m3 booth. 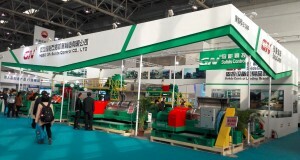 GN Solids Control takes all its main equipment line for the show and welcome for your visit. 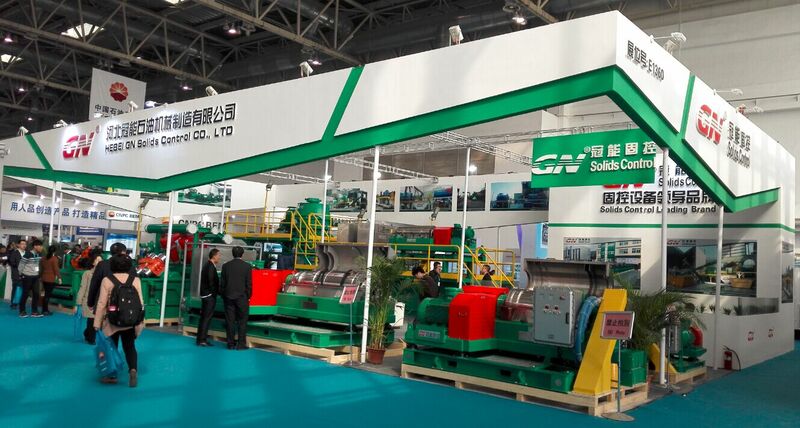 GN Solids Control welcome you come for the show check by yourselves and see the different of GN Solids Control equipment with normal Chinese brand. As an international brand, GN Solids Control will take its highest quality products per international standard and the economic standard products pre China standard to suits different applications of worldwide clients. OTC, as one of the most famous and professional exhibitions about the exploitation, production, environment protection of Oil & Gas on the world, is held in Houston City each year and attracts thousands of global customers in the Oil & Gas fields and relevant industries . Houston City is called as the “Oil City of America” in Texas. From May 2 to 5, the 2016 OTC Exhibition will be held in Houston. 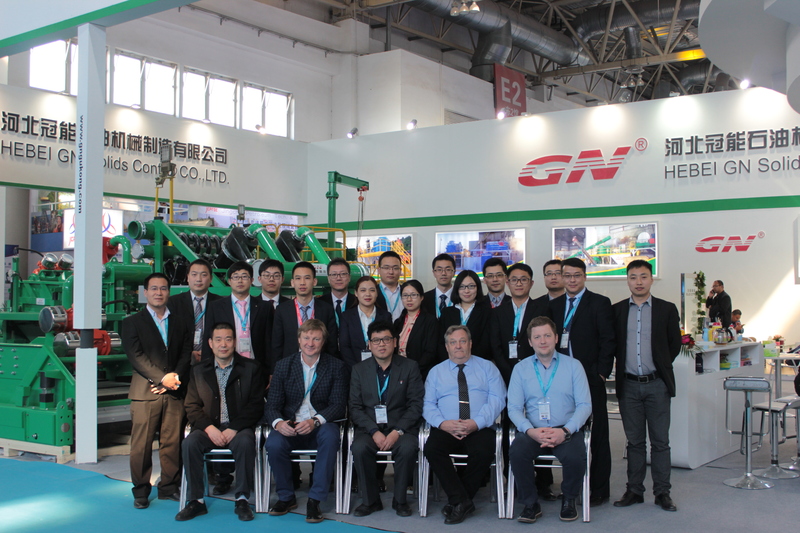 As a world-wide top manufacture of Solids Control Equipment and drilling waste management equipment, GN Solids Control has attended the OTC Exhibition for many years by taking its newest products each time. Here below are the pictures that GN Solids Control attended the OTC Exhibition in 2015. In 2016 GN Solids Control will absolutely not miss this opportunity to have much more contact with its global customers and learn customer requirements and continue to attend the OTC Exhibition. The latest and key products will be showed at this exhibition, such as the Mini Decanter Centrifuge, Shale Shaker, Vertical Cuttings Dryer, etc. 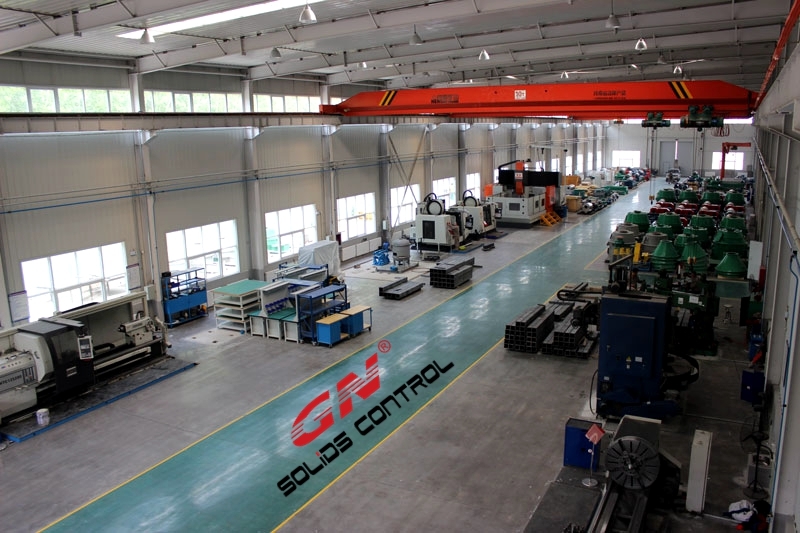 Since GN Solids Control was founded in 2007 year, the business has kept expanding fast and steadily. Even though in the past 2015 that the oil price is low and the world economy is suffering, many of the drilling rigs are out of work, still GN achieved very good sales performance. 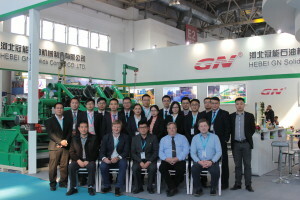 Compared with attending the previous OTC Exhibitions that GN Solids Control only has 1 exhibition booth, in order to show strength and have much more connection with the customers from global market by grabbing this opportunity, GN already booked 2 booths in 2016 OTC Exhibition. The Booths Numbers are 1652-A & 9732. By then, sincerely welcome all the customers from global market to visit GN Solids Control. Besides, GN America LLC is also located in Houston, also sincerely invite all the customers to visit the company of GN America. Finally, if you want to learn more about GN Solids Control, welcome to visit our website and contact us. Shale shaker, mud cleaner, desander, desilter, vacuum degasser, chemical mixing unit, jet shearing unit, mud agitator, bottom mud gun, shear pump, decanter centrifuge, vertical G cuttings dryer. The mud tanks range including:shale shaker tank, trip tank, intermediate tank, suction tank, mixing tank, reserve tank, chemical tank, etc. The mud handling tank will be installed on the mud tanks as solids control system for the drilling rigs. The shale shaker we can supply including 3 panel screen shaker, 4 panel shale shaker, 2 panel shale shaker, double deck shale shaker with scalping shaker deck. The scalping shaker deck usually with coarse mesh size to separate big solids, it could protect the main shaker screen and increase the cleaning performance. The mud cleaner we can supply including desander unit, desilter unit and 3 in 1 unit, the 3 in 1 unit is the combination of desander cone, desilter cone and bottom shale shaker. The bottom shale shaker could be single deck shaker or dual deck shale shaker. The desander cone quantity and desilter cone quantity could be choosed for different treating capacity, our standard model including 500gpm, 1000gpm, 1500gpm mud cleaner. When the bottom shaker is with double deck, we will call it desander unit or desilter unit, it is usually works for construction works, like bored piles, tunneling, etc. Centrifugal pumps work as feeding pump of the mud cleaners. 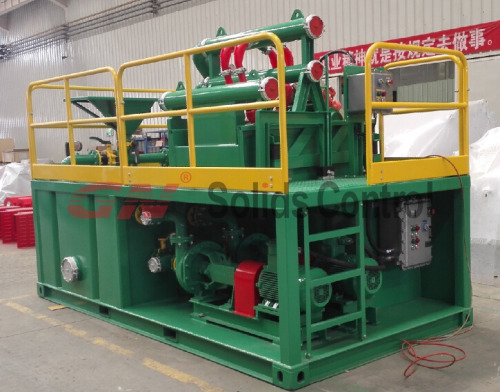 If you need mud handling equipments with mud tanks and drilling mud system, pls contact with GN solids control in Beijing, China or GN solids America in Houston, USA, we have the main mud handling equipments in stock for immediate shipment. 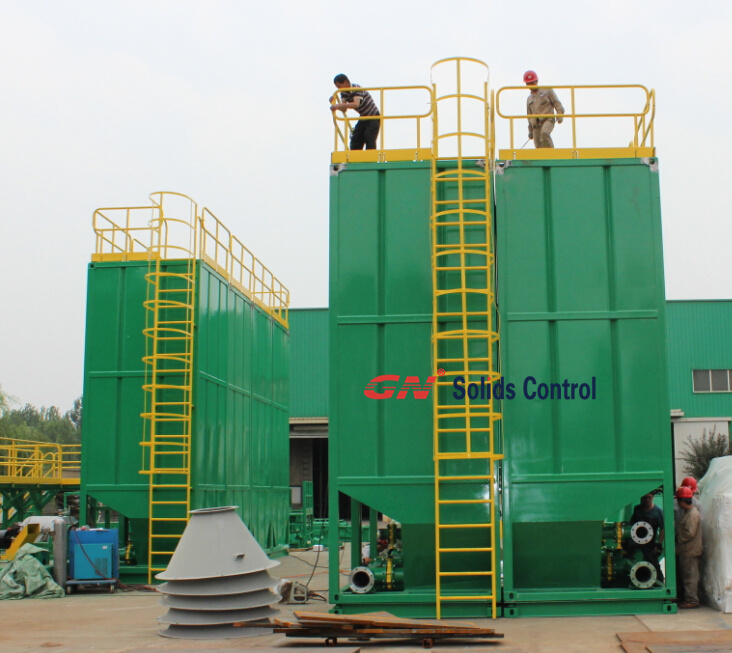 GN solids Control is leading company from China who has been taking care of solids control for many years. Right now GN Solids Control provides two branch companies, an example may be GN Solids America LLC (which is located in Houston, TX), the other one is GN Solid control Russia (which is located in Moscow, Russia). Many large online businesses are using GN mud methods to separate the solids through fluids. Just some days just before, GN Solids Control offered one set of GNMS-500GL mud method for one HDD client. The particular treating capacity of this method is 500 GPM. With an additional mud tank, it can be utilized to storage more mud what exactly is HDD area. GN Solid Control professional engineers visited the worksite and made it easier for this client to set up it, trained the onsite workers. All the after sales services was only last for one week, it can be used proficiently by operators, the 7 days furthermore including the guidance of the arrangement this mud system. The mud after going the horizontal drilling rigs will be sent to the shaker in advance. By using different API no . shaker screens, GN shakers can be used to separating several solids size. Generally speaking, allergens larger than 100 microns will likely be separated by shaker. Fluids will be send in the mud cleaner regarding finer separation after handled by GN shaker. 2 different size cyclones will certainly separate the solids coming from 100 microns to 20 microns. Here is a 2 period separation: the 10 in . cyclones separate solids bigger than 50 microns, while the some inch cyclones separated debris larger than 25 microns. GN Aircraft Mud Mixer is efficiently used to add chemicals inside the drilling fluids so they can end up being reused for horizontal going again. A couple pumps are used to feed into your mud cleaner, while another centrifugal pump is used for you to pump the chemicals in the soil tank. There are also several light on the tank to supply a better working condition. 1) 2 sets helicopter shale shaker, GNZS594E-HB, GN Solids control shale shaker is with good performance and well support from us. This is 4 panel shale shaker with Composite material shaker screen. 2) 1 set helicopter mud cleaner GNZJ594E-2S12N, the treating capacity can reach to 1000gpm mud system. The mud cleaner with 2 pcs desander cones and 12pcs desilter cones, spare parts can also be replaced easily. 3) 2 sets helicopter decanter centrifuge. The centrifuges are also fixed speed centrifuge with smaller carbinet control panel. Variable speed centrifuge require a relatively large VFD control panel separated from centrifuge. However, the space in offshore is not allow. But one disadvantages for fixed speed control is that the speed change will be much harder, it may take about 3 hours to change the belt pulley to get different speed and it is not continuously change. 4) 8 sets helicopter mud tanks. The mud tanks is used vertically, not like conventional horizontally used mud tanks. All the helicopter equipment must be certified with third party certificate on lifting points and other related issues. 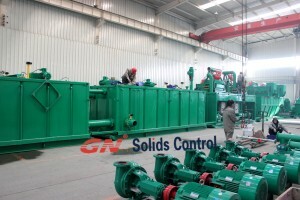 GN Solids Control is China No. one and China leading manufacturer for helicopter solids control equipment and helicopter drilling waste management equipment. If you need any support, pls contact us freely. With reliable quality equipment, reliable sales price, and guaranteed after sales service, GN Solids Control will not let you down. 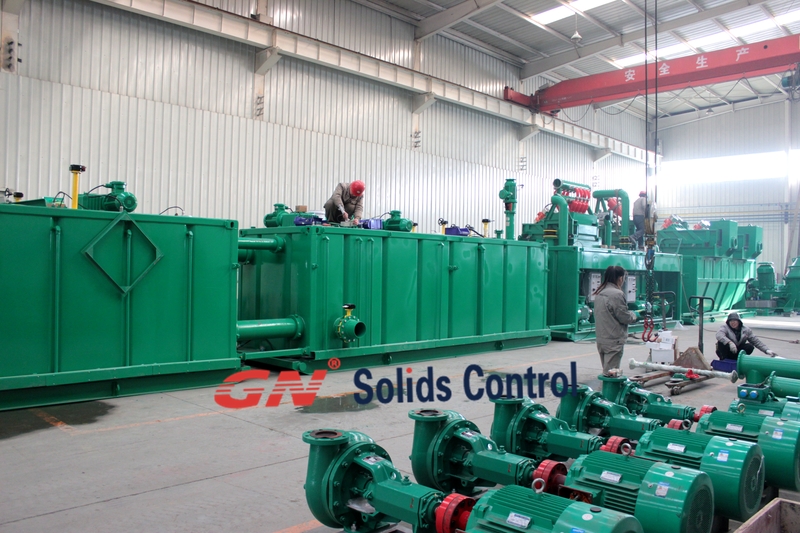 Starting up from solids control equipment and system for oil & gas drilling as the leading manufacturer in China, GN Solids Control has also grown to be the leading manufacturer of mud recycling system for trenchless project such as HDD & Tunneling. With a few years’ development, GN exported over 20 sets of mud systems for HDD&CBM to Australia, and also established partnership with TT Asia who is authorized as GN exclusive agent in Australia. The one main reason why GN successes in Australia is that GN product enjoys top quality and stable performance; the other is that GN has been attending to Australia No Dig show for 4 years in succession. Absolutely, GN Solids Control will attend the 2015 No Dig show in Australia. Details are listed as blow. This time, GN Solids Control will display its standard model of 200GPM mud system which is composed of one GN mini cleaner, one feeding pump, one mud hopper, one mud mixing pump, one mud gun, one tank and accessories. Regarding to the main treating equipment mini cleaner, it is double deck bottom shaker with 4 desilter cones on the top. The bottom deck screen will serve as the first phase treating to remove coarse solids; the desilter cones serves as the second phase treating to separate solids over 20 microns. Then the mud will be mixed with chemicals through venture mud mixing hopper when it is discharged out by the mixing pump. After mixed, the mud will be reused. Welcome to GN booth on 2015 Australia No Dig Show. GN Solids Control is one of the most professional manufacturer on mud solids control equipment for drilling rigs. 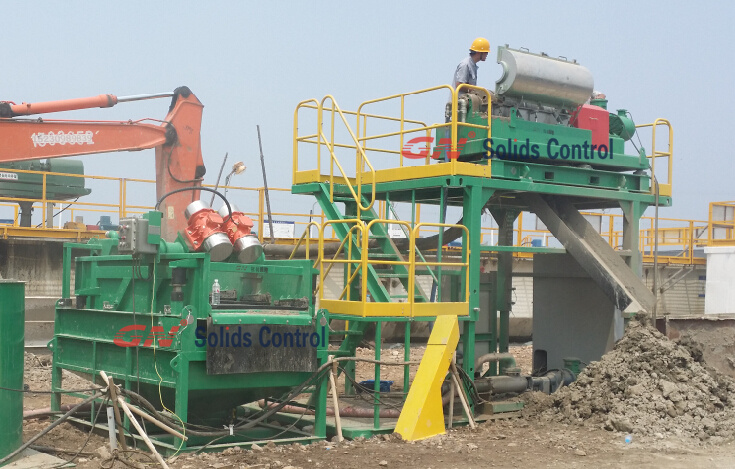 With its long history and rich experience on solids control field, GN Solids Control owns good reputation on the market. Unlike other Chinese suppliers, GN Solids Control only focus on domestic top market and international market with top quality products, reliable services and reasonable price. Or order to offer international customer with fast delivery and direct service, GN Solids Control have warehouse or branch company in main markets. From year 2014, GN Solids Control started its own branch company in Moscow Russia. GN dispatched 3 complete sets solids control equipment to a Russia customer. The customer compared different China manufactures and finally decided to buy from GN, although GN price is higher than other suppliers. They know that, GN has much more understanding on international market, and their equipment manufacturing standard is higher than others, it deserves the cost. 1) Solids Control decanter centrifuge, 3 sets, with fixed speed control panel for hazardous environment for explosion proof. The centrifuge is made per international high standard to suit for both mud solids control and drilling waste management field. 2) Decanter centrifuge feeding pump, it is German brand NETZSCH suits for drilling waste management, with long lifetime and easy maintenance. 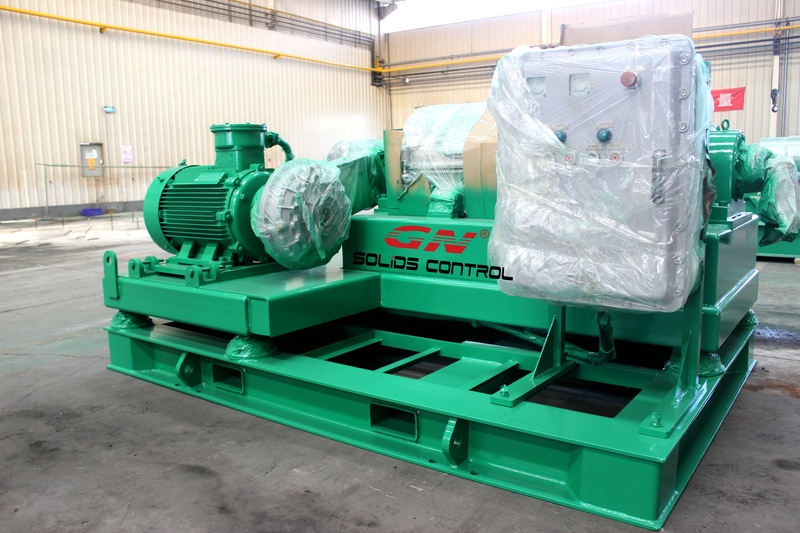 3) Solids control shale shaker, linear motion for oil and gas drilling rigs. 4) Solids control mud cleaner. It is combination of desander, desilter and linear motion shale shaker. It is welcomed in jobsite with its compact design the small footprint. 5) Centrifugal pump, feeding for desander, desilter. It can also be used for mixing pump for jet mud mixing system. 6) Mud mixing hopper with mud shearing ventures, discharge nozzles, sack cutting tables & isolation valves. GN can also offer complete jet mud mixer complete with electrical control panel. All equipment mounted on the same skid , with necessary pipes for turn-key-solution. GN is a young company with energy, with passion. Every year, we made some improvments, will never paving at the same places for a decade. With more and more focusing on waste management & environmental protection, this year to OTC, our main exhibiting product became the verticle cuttings dryer & high speed decanter centrifuge. 1) GNCD930D Series Vertical Cuttings Dryer. GN Solids Control is one of the only two companies in the OTC 2015 who displayed the vertical cuttings dryers. Unlike our competitors vertical cuttings dryers, GN dryers is with higher speed up to 1200RPM with G force up to 750G. This gives it more ability to separate the oil on the cuttings, especially of WBM, it works well for the critical WBM. GN has already done successful drilling cuttings management projects for Shell, Baker Huges, CNPC and many more leaders in the industry. As we always keep telling, the statege, finally works well. When the flowers blooms outside the wall, people inside smells. Well, after big players comes to us, and like a healthy cycle, business is on the right track. 2) High Speed GNLW363CG-VFD Decanter Centrifuges. GN 363 series Decanter Centrifuges is the most popular size decanter centrifuge for drilling mud treatment. GN built over 100 this size of decanter centrifuges in 2014. This type and size of decanter centrifuge is popular for solids control, dewatering ,waste management, sludge treatment. After optimized the whole structure, now the mud cleaner can be easily disassembled to two main parts, the cyclone frame, and the underflow shaker. Not like the old designs, need keep matching all the four bolts. If sometimes needed to be disassembled, the tragedy comes. If not something well accurate manufactured, well maintained, days passed to assemble it.